You can put together your own wonderful creations in Elements 15 using the Create panel. To see the creations available on the Create panel, click the Create tab above the Panel Bin. Like the Share panel, the Create panel is available from either the Organizer or the Photo Editor. The Create Panel from the Organizer (left) and Photo Editor (right). The Create panel offers identical options in Windows and the Mac. 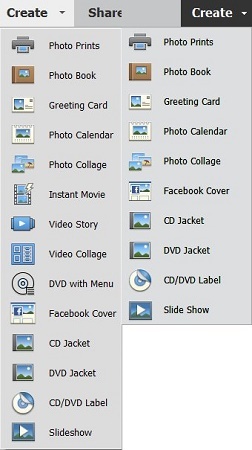 You find options for creating photo prints, photo books, greeting cards, photo calendars, photo collages, an assortment of choices for DVD labels and jackets, and two options for use with Adobe Premiere Elements (Instant Movie and Video Story). Keep in mind that you need to acquire the bundle of Photoshop Elements and Premiere Elements in order to use the video creation options. Elements 15 introduces a new creation with Video Collage. This creation offers you a means for creating a collage of video clips and still images to assemble your most memorable events. As with other video creations, you need to install Adobe Premiere Elements. When you open the Create panel in the Photo Editor, you won’t see the options for video creations.